One of the sculptures at the entrance of the hotel. The three 15-m-high sculptures have recently being installed by Foibos Design at the entrance as well as by the poolside of the five-star hotel. 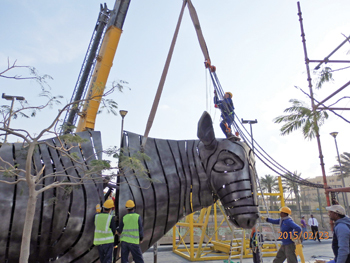 The challenging installation work was completed in seven days on 12-hour shifts – although the schedule allowed for five days per sculpture, according to Milan Spiller, regional manager and project director for Foibos Middle East. The company, which has created a niche for itself in the high-end interiors market through its artistic creations using blown glass, is now making giant strides outdoors with these structures, which combine high-end technology and advances in 3D scanning and engineering and the use of CMM (coordinate measuring machine) technology. The sculptures are the handiwork of a select group of artisans and craftsmen that worked under the direction of sculptor, designer and art blacksmith Radomir Barta of the Czech Republic. Molybdenum, an element frequently used in high-strength steel alloys, has been used in creating these sculptures to give them the necessary qualities to endure Qatar’s hot climatic conditions. The oryx, made of 316 grade steel with a satin steel, are coated with a special Siral coating from Italy to give them a black-grey hue and resistance to temperatures up to 600 deg C. They are further protected with special nano coatings to keep them dust- and water-repellent, and also prevent corrosion and discoloration. Commenting on the challenges of the project, Spiller said: “The sheer height and complex construction of the oryx sculptures make them unique and ground-breaking. The cladding of the structures has involved intricate design engineering which required the creation of more than 400 original drawings for the cladding strips that faithfully recreate the outline of the body of an oryx. Each piece combines sophisticated cyber technology and the skilled handiwork of metal craftsmen. Workers putting together one of the sculptures. The TIG welding technique was preferred mainly for stability, durability and aesthetic reasons. Further challenges were encountered in the transportation of these sculptures from the Czech Republic, where they were created, to Qatar. To do this, each oryx weighing 12 tonnes was dismantled into three main segments comprising head, body and legs, antlers and tail and transported in special custom-built steel transportation cages designed by Foibos. The head and main body were anchored to these cages to prevent movement and the sculptures were transported by DHL Logistics, from the factory located 100 km from the capital Prague by road, then river barges and finally from the German port of Hamburg – a journey which took 28 days. All three sculptures were transported together in six trailers and unloaded with special cranes. An international team of more 35 people – including four Czech technicians and supervisor and labourers from Bangladesh, Pakistan, Nepal, India, Syria, Lebanon and Korea – supported by three cranes then set about assembling these giant structures, starting with the legs which were anchored to steel plates on a reinforced concrete base with 60 kN strength after which the head and body were connected using structural flange metal, nuts and bolts and lifted into position using cranes. 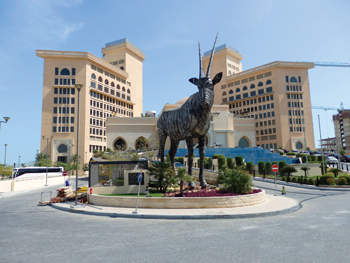 Installation of the oryx posed a major challenge for Foibos as the sculpture was required to be hoisted over the hotel’s Gordon Ramsay restaurant, as there was no road access to site. The company arranged for a crane with a 60-m reach. Spiller said that the stainless steel sculptures are the largest of their kind in the world and Foibos is now aiming to secure recognition from the Guinness Book of Records. The installation is backed by a warranty and maintenance services for the first year. Last January, Foibos installed what Spiller claims to be the longest chandelier in Qatar which is 27 m long for the Hilton Double Tree. The company also installed glass sculptures known as Four Seasons for the Marsa Malaz Kempinski at The Pearl last December. Apart from projects in Qatar, Foibos is currently producing 180 chandeliers on the public areas and guest rooms of a Rotana hotel as well as special interior glass walls for private villas in Saudi Arabia.